At Matthew James Removals we believe in supporting and promoting our staff to become the best they possibly can be. Jack Brown joined our company in 2014 as a porter and van driver. It quickly became clear that Jack had just the right personality traits to become a truly dedicated Matthew James removal man and had a great deal more to offer than just van driving (although he was very good at that). In 2015 we invested in Jack’s future and funded his category C driving licence. That’s a licence to drive a rigid lorry of unlimited size, for those that were wondering. Jack passed his category C licence on the first attempt and has since proven to be a natural-born lorry driver, travelling the length and breadth of the UK as well as several European countries. Two years later and with several thousand miles of road travelled, we decided it was time for Jack to make the jump from category C to category C+E (enabling him to tow a trailer). Once again funded by Matthew James Removals, Jack undertook an intensive 5 day training course with TrainDRIVE training services in February 2017 and we couldn’t be prouder to announce that he passed 1st time! It’s not just about supporting and nurturing our staff. It’s much more than that. 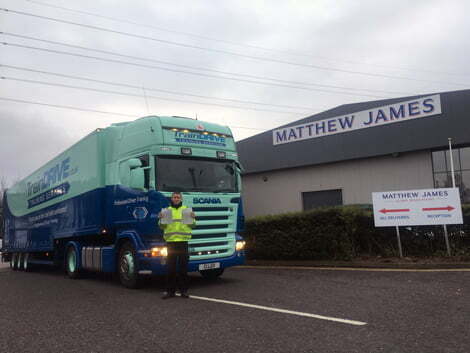 In 2016 Matthew James Removals’ lorries travelled over 329,000 miles. That’s enough to drive all the way around Earth 13 times! The safety of other road users and, of course, the safety of your goods is of paramount importance to us. We will continue to invest in training for our staff so that you can continue to have confidence in us.